Donna Darling and Sammy Clark are in Chicago doing their Christmas shopping and attending to some business relative to the Donna Darling Review. They have had a splendid season up to date for 1926 and 1927 looks very promising to them. Why not? They are a clever people with good material and pleasing individuality. On December 12th Donna & Sammy played in Dubuque, Iowa and on the 19th, they opened at the Colonial Theatre in Detroit. So they were probably in Chicago between the 13th and 18th. 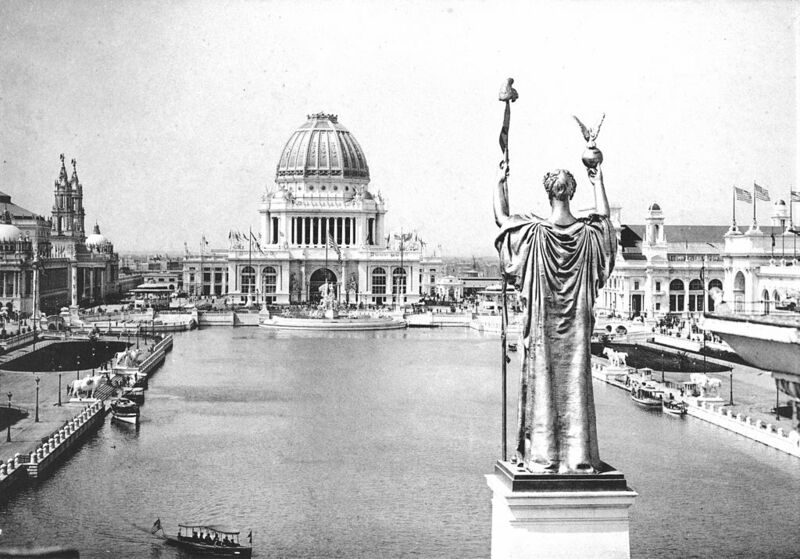 Source: The University of Illinois at Urbana-Champaign – University Library. I was recently asked to help someone learn more about his ancestry. He knew he was Italian, but didn’t know how much. He also knew his parent’s names, and where they were born and where they lived, but not much more. My first recommendation was that he take an autosomal DNA test. It might give an idea of some of his ancestry. It also might provide connections to here-to-for unknown cousins that may know much more of the family history. I ordered a kit for him through Ancestry.Com and he has received it. I also began looking at his parents and see what I could learn about them. I found information about his father quickly. Information about his mother was more difficult to find. There were different spellings of her name, both first and surname. There were also differences in both date and place of birth. I didn’t find anything that I was convinced was correct regarding her ancestry. Then I used Newspapers.com and did a search for her maiden and surname in the states she was believed to live in. The results provided an obituary for her sister and provided the names of some of her other siblings. It then became easy to find her in the 1940 Census and other census records. A minor stumbling block overcome thanks to Newspapers.com. I will write more about Emily in my next post of the Crutchfield-Galella project. But for now, I would like to focus on Ralph Crutchfield. I don’t normally write about parents, however, because this family line is completely unknown to me I wanted to understand their lives also. Ralph Crutchfield was born the youngest of four children on 24 December 1913 in Russellville, Pope County, Arkansas. His parents were Ervin Ogden and Dormer Crutchfield. I have not had a chance to research his two older sisters, Blanche and Florence nor his older brother Emanuel. The 1920 Census indicates the family living in Illinois Township, Pope County, Arkansas at 319 Torrence Street. The family consisted of the six-year-old Ralph, who was attending school, his parents, and his three siblings. His father, Ervin, was a coal miner. In 1930, Ralph attended Russellville High School as a Junior. The 1930 Census indicates that his three siblings were no longer living at home and the household consisted of him, working as a newsboy for the newspaper, his father who also worked for the newspaper as a newspaper agent, and his mother who kept house. In 1931, Ralph graduated from Russellville High School. 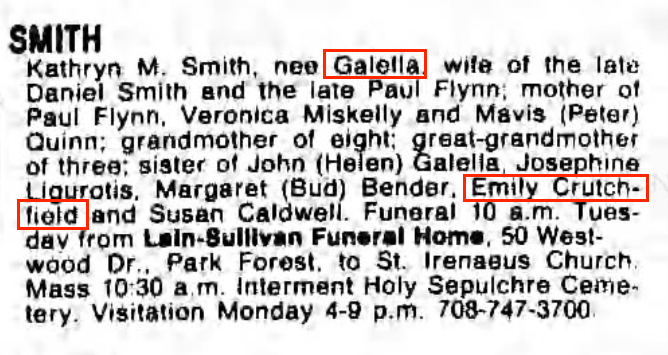 It appears that Ralph met and married Emily C. Galella sometime before 1935 as the two of them are living in Chicago then. The 1940 Census shows Ralph, his wife “Emile” and their two children renting a home at 3312 Hoyne Avenue, Chicago, Illinois. Ralph was working as a soda fountain manager at a retail drug store. In 1951, Ralph was living in Illinois when he registered for Social Security and received his SSN. Ralph Crutchfield died on 21 July 1997, probably in Chicago, I at the age of 83. His burial location is unknown. Think you might be related to Ralph Crutchfield? A DNA Test at Ancestry.Com will prove it one way or another. 1920 Census (A), Ancestry.Com, 1920 Census – Ervin Crutchfield – Illinois, Pope, Arkansas. http://search.ancestry.com/search/collections/1920usfedcen/40011696/printer-friendly. 1930 Census (FS), Family Search, 1930 Census – Ralph Crutchfield – Illinois, Pope Arkansas. https://familysearch.org/ark:/61903/1:1:XMGQ-WDX. 1940 Census (A), Ancestry.Com, Ralph Crutchfield – Chicago, Cook, ILL, ED 103-2877, Sheet 9B, Line 77. http://search.ancestry.com/search/collections/1940usfedcen/144720395/printer-friendly?_phsrc=UeZ897&_phstart=successSource&usePUBJs=true&gss=angs-g&ne. U.S., School Yearbooks, 1880-2012, Ancestry.Com, Russellville High School 1930, Russellville, Arkansas – Climax yearbook, Page 25 – Ralph Crutchfield. U.S., School Yearbooks, 1880-2012, Ancestry.Com, Russellville High School 1931, Russellville, Arkansas – Climax yearbook – Ralph Crutchfield. U.S., Social Security Applications and Claims Index, 1936-2007, Ancestry.Com, SSA&C – Ralph Crutchfield. http://search.ancestry.com/search/collections/Numident/806318407/printer-friendly?_phsrc=UeZ906&_phstart=successSource&usePUBJs=true&gss=angs-g&new=1. U.S., Social Security Death Index, 1935-2014, Ancestry.Com, SSDI – Ralph Crutchfield. http://search.ancestry.com/search/collections/ssdi/13415883/printer-friendly?ssrc=pt&tid=51376149&pid=27567751021&usePUB=true.